This article, which appeared in the Berlin Reporter and the Coos County Democrat, is reprinted with permission. It was written by Randolph resident and former Randolph Community Forest Commission member Edith Tucker. 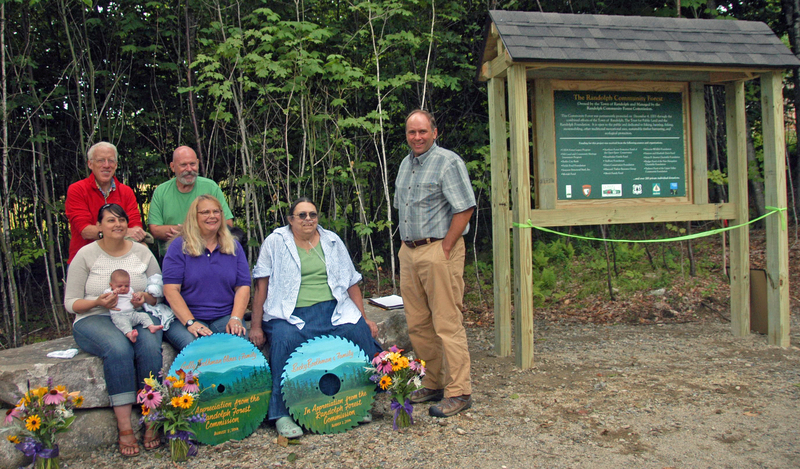 RANDOLPH — Two sisters — Becky Boothman and Sally Boothman Glines — plus their families were honored on Saturday morning as part of the annual Randolph Forest Day that this year featured the ceremonial opening of a new RMC trailhead and car parking lot on the Boothman Tract on Randolph Hill. Both were presented round saw blades that were painted with mountain scenery by artist Andre Belanger of Berlin, designed to commemorate the day. Randolph Forest Commission chairman John Scarinza detailed the two-step process by which the 10-acre Boothman Tract on Randolph Hill was added to the 10,000-plus-acre Randolph Community Forest (RCF) that took place when the family divided up the last of 150 or so acres on which the family farm and later the Mt. Crescent House, a country summer hotel, were located. Thomas, the first male Boothman, arrived in Randolph some time between 1839 and 1850, when he was first listed as a farmer on the U. S. Census. Boothmans, Watsons, and Kelseys dot the family’s genealogical records. The two “Boothman girls” — Becky and Sally — agreed to make the lot that was best suited for use as Randolph Mountain Club (RMC) trailhead, that could provide adequate parking, especially for the increasing number of winter hikers, cross-country skiers, and snowshoe enthusiasts. Members of the Boothman family — Maria Neal and her six-week-old baby, Gwen, left, front row, Sally Boothman Glines, and her sister Becky Boothman, mother-in-law of Maria and Gwen’s grandmother; Chris Hawkins, left, standing, widower of Becky and Sally’s sister Sue, and Greg Glines — were honored on Saturday by the Randolph Forest Commission, whose chairman, John Scarinza, right, standing, happily looks on. The ribbon was later ceremonially cut on the Randolph Community Forest kiosk. Money was raised to cover this cost and the town purchased the tract in 2007 to add to the RCF. After that, Becky and Sally and their adult children pitched in to help raise money by putting on two delicious Mt. Crescent House-style buffets and two Mt. Crescent House-style Boothman Spring cookouts that took Randolphians down Memory Lane. The funds raised helped to pay for building a well-ditched and graded parking lot along with relocating some RMC trails on the Crescent Range, now located on publically owned protected land. It was Becky and Sally’s grandfather, John H. Boothman, who realized that the hoteliers, other locals and the summer people had a vested interest in restoring and maintaining the footpaths after the extensive heavy logging that took place in the early 20th century. He spearheaded the Club’s founding in 1910 and in 1915 worked to incorporate it as a N. H. nonprofit organization. Scarinza highlighted the extended family’s close ties to the land over seven generations and the sixth generation’s pleasure in knowing that traditional uses — timber harvesting and outdoor recreation — will be able to continue in perpetuity. The youngest member of the family – Gwen Luna Parker — born on June 19 at her parents’ home in Randolph— was on hand at the ceremonial kiosk ribbon-cutting with her mother, Maria Neal. The six-week-old baby’s dad, Jeff Parker, was in Washington State as part of a N. H. contingent of 20 wildland firefighters who went west on Saturday, July 26, to fight an extensive uncontrolled forest fire burning in the Okanogan-Wenatchee National Forest. 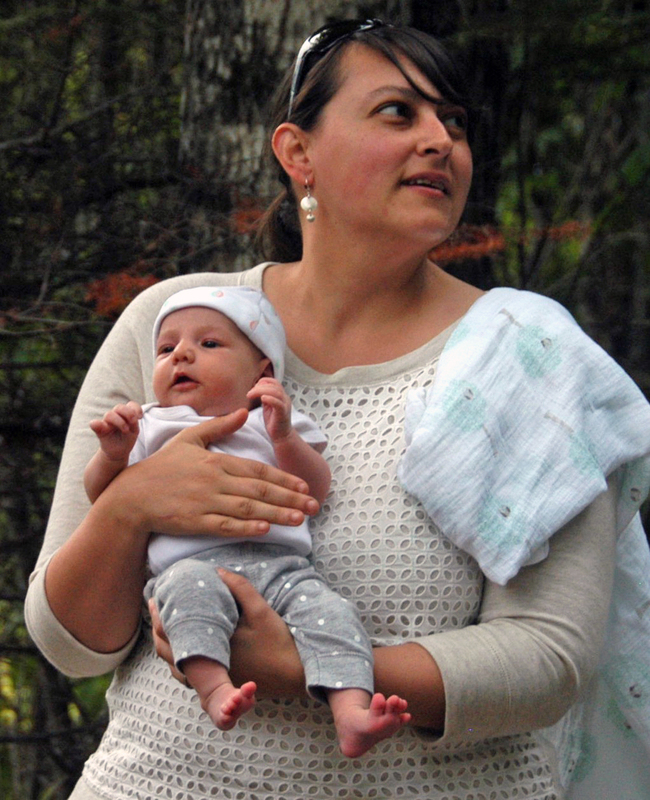 Six-week-old Gwen is Becky Boothman’s granddaughter. Scarinza, who chairs the Randolph Forest Commission and has almost completed a term as RMC president, also gave special thanks to Reed and Carol Henderson for their generosity in supporting the trailhead project. Brian Bresnahan of Groveton, Congresswoman Annie Kuster’s on-the-ground North Country constituent service representative, read a congratulatory letter that had been e-mailed that morning from Washington, D.C. Kuster addressed the ongoing importance of forestry and outdoor recreation in the Second Congressional District. Kuster serves on the House Committee on Agriculture, the House Small Business Committee and of the House Committee on Veterans’ Affairs. The Randolph Community Forest’s team — forester Walt Wintturi, formerly of Gorham and now of Plymouth, and both wetlands specialist John Severance and wildlife specialist Elise Lawson of Watershed to Wildlife, Inc. of Whitefield — weighed in on aspects of managing the forest and the importance of maintaining wildlife openings. Scarinza said that an interpretive trail and a community sledding hill are now being planned.